At the heart of South West minorities ! 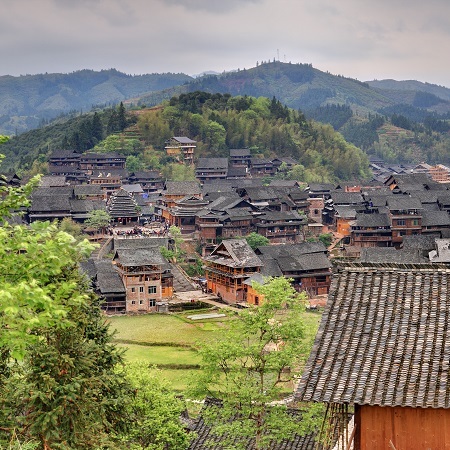 This trip to Guizhou and Guangxi will take you through minority villages off the beaten track of Guizhou, through a myriad of amazing small villages like Jidiao or Kaili. 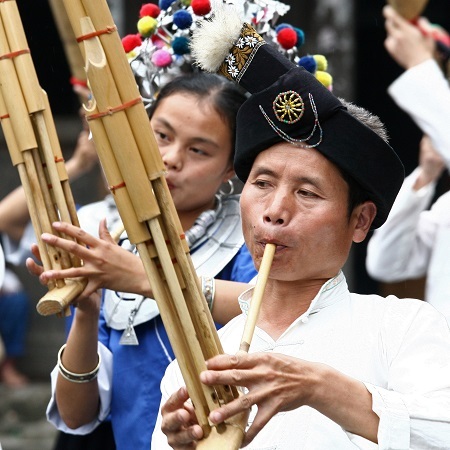 You will hear Dong polyphonic songs in Zhaoxing, see an abundance of local crafts and explore villages with traditional architecture of more than 2000 years. 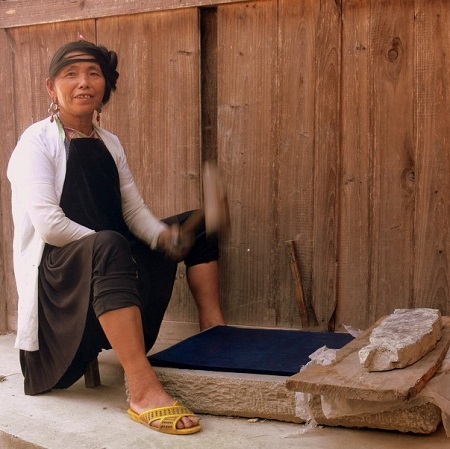 One of the specificities of this tour is a 3-night stay in the heart of the remote Miao country, around Danian, where you can still live to the rhythm of ancient traditions preserved, and discover on site the formidable work of the association “Couleurs de China”, which we support. 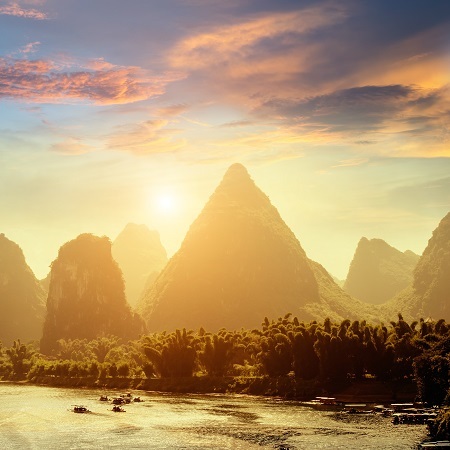 You will continue to Guangxi, through the beautiful Dongyang village of Chengyang, and the rice fields of the Dragon Thorn around Ping’an village, before ending up in the heart of the magnificent Yangshuo landscape of Chinese prints. This circuit can be adapted according to your possibilities and your desires. Your budget and availability will also be taken into account. Live fully this immersion! Flight to Guiyang. Welcome your guide and driver then departure to the region of Qiandongnan, a long-isolated area that includes many minorities, through the region of Gaozhai, where there is a branch of ethnic Miao, called “Miao small flowers”, recognized for the beauty of the traditional costume of his women, experts in batik who wear their daily jackets embroidered with small flowers. Landscapes of rice fields mixed with corn fields line the route. Continue to the small village of Langde built on the mountainside located in the mountains of Thunder. Night choice according to comfort: Kaili or Langde. Installation at your hostel then visits around the village famous for its handicrafts. Overnight homestay in a traditional wooden house in the heart of the village, simple comfort, or Kaili in 4 * Grand Dragon Hotel, 200RMB supplement / room). 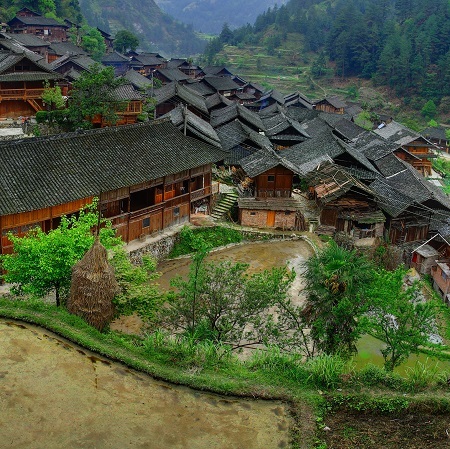 Walk to the small village of Jidao located in the Tonnerre Mountains with the visit of the two parts of this Miao village located along the Bala River. 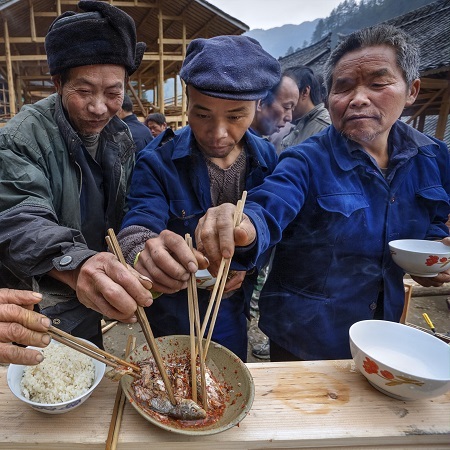 Lunch at a Miao family. Departure to the small village of Shiqiao where paper is still made according to traditional ancient techniques based on wood. Departure for the city of Sandu, stop en route in Gaoyao village, where you can admire beautiful rice terraces. Night in Sandu 3 * hotel (standard comfort) or night homestay in the village Shui de Bahui (same rate as the hotel but with dinner at the inhabitant included). Continuation to the region of the peoples of the water “Shui”. 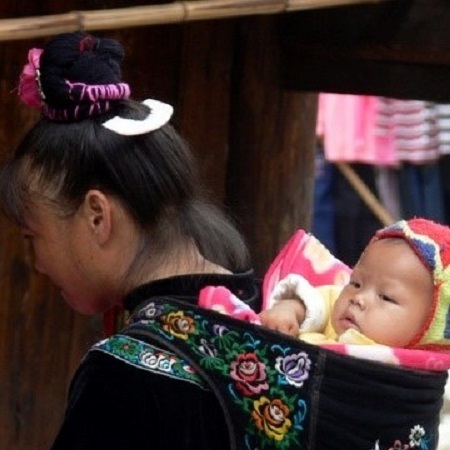 Depending on the dates you may have the opportunity to stop en route in the ever-lively markets, and meet ethnic Shui and Miao who wear their traditional costumes in a natural way. Discovery of Shui and Miao villages in Dujiang and Dayu. Road to Zengchong Dong Village set in a river loop at an altitude of 640 m, it is surrounded by terraced hills and has the oldest drum tower in China (1672 Qing Dynasty). Dinner and overnight at homestay included (Comfortable hotel possible in the neighboring town of Rongjiang, same price without dinner). Departure by car to the Moon Mountains around the localities of Jiajiu and Jiabang to visit their famous rice terraces. Some travelers claim that the rice fields of Jiabang, still little visited, are the most beautiful of China (Judge you!). Short hike around the hamlets and terraced cultivation cultivated by the Black Miaos, Green Miaos and Red Miaos. Night in Jiaju in hostel, simple comfort. 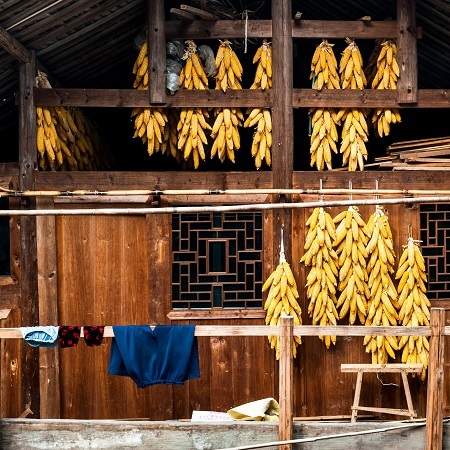 Continuation of the visits around Jiabang (small possible hike between two villages or in the rice fields) then find your vehicle and departure towards the big village Dong of Zhaoxing. Arrival in Zhaoxing, a beautiful and authentic village populated by Dongs and crossed by small canals and streams. Overnight in Zhaoxing at Indigo Lodge or Creekview Inn, traditional style wooden house (Good Comfort). 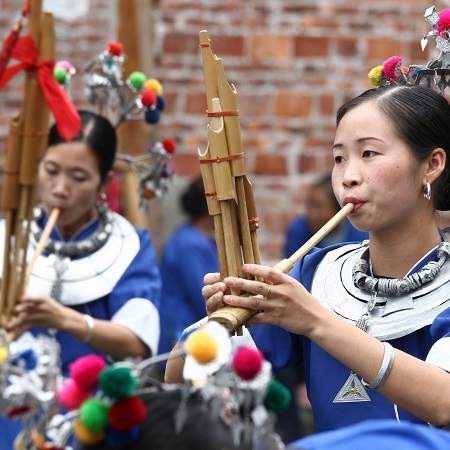 Today visit Zhaoxing and its region with the discovery of the many traditional buildings and wooden architectures that make the reputation of the Dong people: traditional theaters of Dong Opera, the 5 Towers drum built by each of the 5 clans of the village, the splendid bridges of the Wind and the Rain. Then departure by car to Tang’an for a hike from the village to Zhaoxing which offers a breathtaking panorama of the entire valley. Morning drive to the small village of Danian located in the heart of the mountains, in the “Miao Country”. 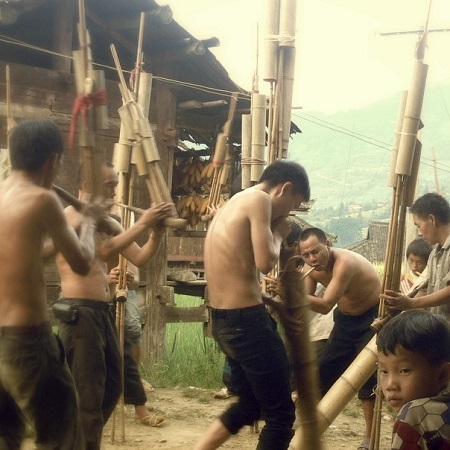 In Fulu Village, you will leave the Guizhou team to cross the river to a remote area. Home of the Danian team. Installation at the Miao Country Welcome Center and first discovery of the activities of the association Couleurs de Chine. This association helps ethnic minority children by financing their schooling. Night in Danian (simple comfort, common sanitary). 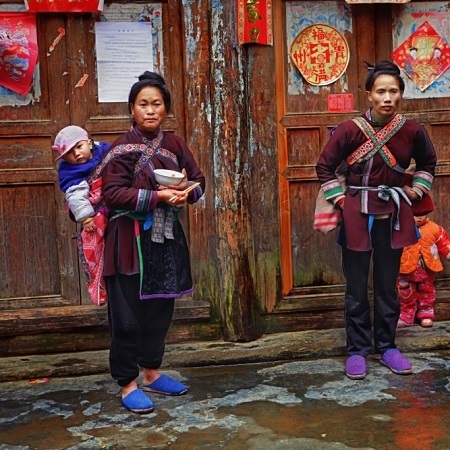 Today, hiking in the Great Mountains and Miao villages, where ancient traditions have not yet disappeared and the traditional way of life has changed little. 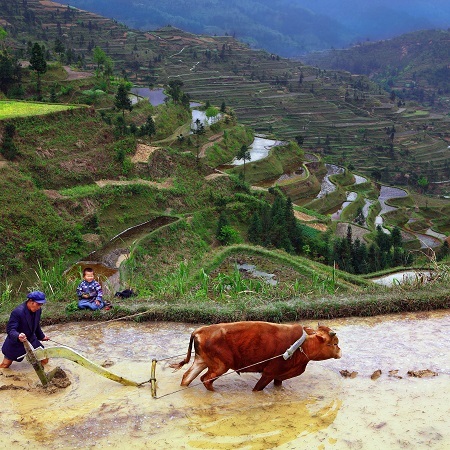 The walking tour along the rice terraces allows a concrete approach to the reality of the work and life of the peasants Miao and Yao. 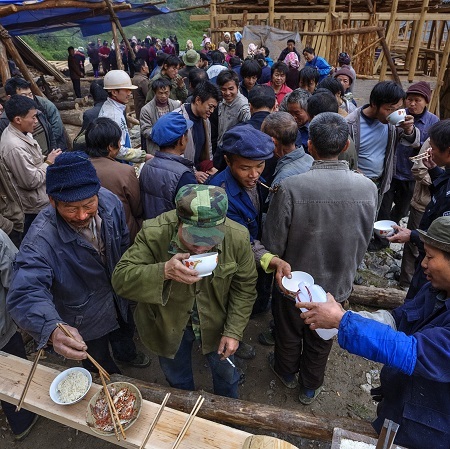 You will attend the rural works depending on the season (transplanting rice, handicrafts: embroidery, weaving, dyeing, basketry, transport of wood in the mountains …). If a village is more than 4 hours walk, you can spend the night in the village, homestay (subject to availability of residents – very simple comfort, no single rooms). It is also possible to go to more accessible villages during the whole stay and to avoid too long walks. All this can be discussed on site with the participants. Overnight in a homestay village or return to Danian. 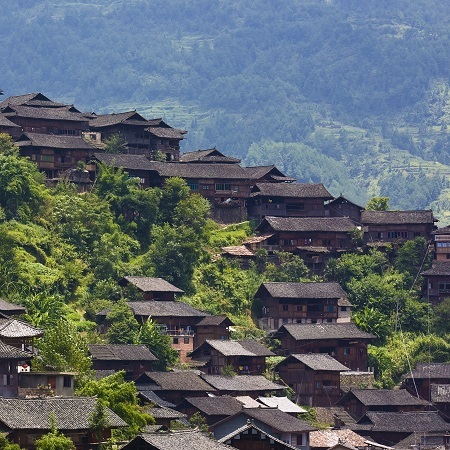 Continue hiking to Yao, Dong or Miao villages. Back on Danian and visit of a school supported by the association Couleurs de Chine. Departure by car to the village of Fulu. Crossing the river to meet the driver and guide of Guangxi, then drive to Dongyang village of Chengyang. Stop en route to the Dong village of Heli sheltering a magnificent wind and rain bridge leading to the Sanwang gong temple (Palace of the Three Princes). Arrival in Chengyang a large village of the Dong minority renowned for its wind bridge and Rain 78 m long and topped with 5 elegant towers. 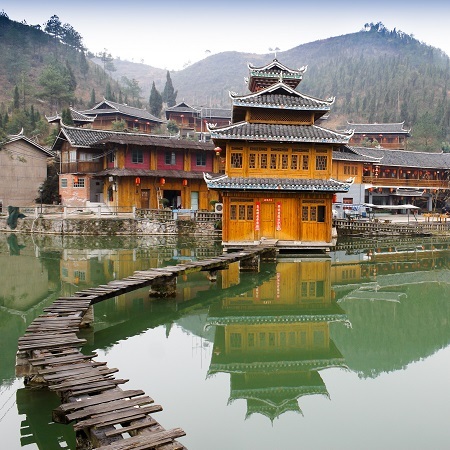 Several bridges of the same type are found in the villages you will visit today, as well as large drum towers. 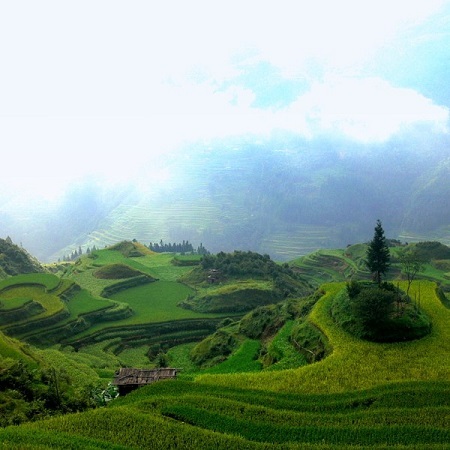 In the afternoon, continue to the beautiful region of Ping’an and rice terraces. 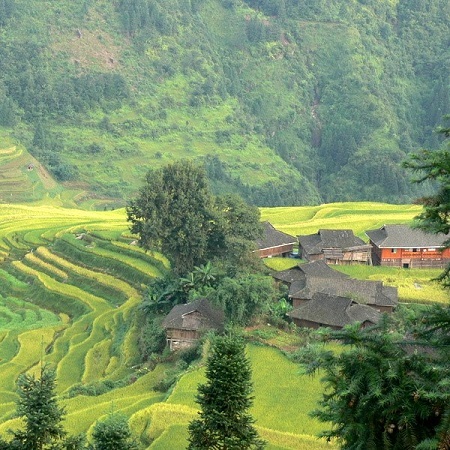 The Dragon’s Backbone is arguably one of the most beautiful rice terraces in all of China. You will arrive below the village of Ping’an which you will then reach on foot by 30 minutes of walk. Settling in the village in a wooden inn (Starwish Inn – good comfort). Day 11: Ping'an - Dazhai - Yangshuo (B) ~ 3:00 drive. Visit the Silver Cave with its beautiful rock formations (the cave is arranged and lit, and accessible to young children), then the Moon Hill, a large mountain break, natural emblem of Yangshuo (observation from below or ascent possible walk with steps that will take you to the foot of the arch, 40min walk to the top). Bike ride on flat (or electric scooter, extra 50RMB / scooter + 80RMB for the guide) to the village of Fuli on small roads further down the Li River (16km round trip). Visit the local market if it takes place today (days 2, 5, 8). Back on Yangshuo by bike. Then, continuation to the village of Yangshuo still very animated. Installation in your hotel. In the evening, enjoy traditional lantern fishing with tamed cormorants. Accommodation at Riverside Retreat located a little out of town on a hill with beautiful views of karst peaks, or at the Moondance Boutique Hotel in the Yangshuo countryside at the edge of a small river. 400RMB / room / night). Day 12: Yangshuo - Xianggong - Xingping - Yangshuo (B) ~ 1h00 + 0h40 drive. After breakfast departure by car to the beautiful Xianggong UNESCO World Heritage Viewpoint. 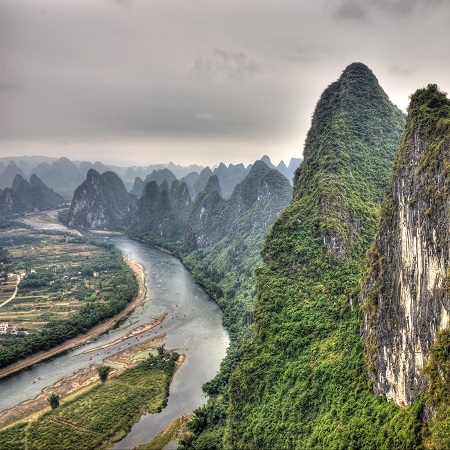 Climb to the top of the scenic point for a bird’s eye view of the Li River. Find the vehicle that will drop you 5km away from a trail that you will walk through the orchards of citrus and small hamlets to the village of Xingping (1h30 to 2h00 hiking). The path offers a beautiful perspective on the river. You will also visit a small temple nestled on the banks at the entrance of the cave of the Snail where some monks still live. Cross the river with the local ferry and discover the old Xingping Street where you can have lunch. 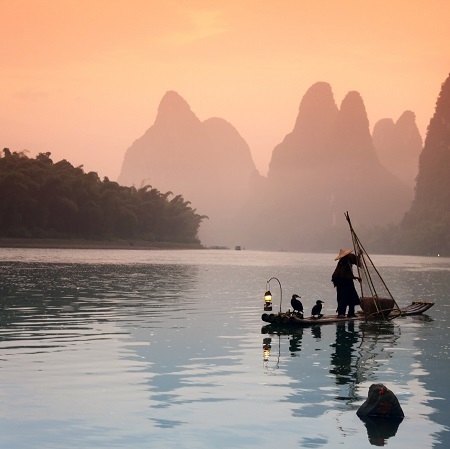 In the afternoon, take a short raft ride on one of the most beautiful sections of the Li River between Xingping and the 9 horses hill, through small fishing villages. After your breakfast, bike ride in the countryside off the beaten path. 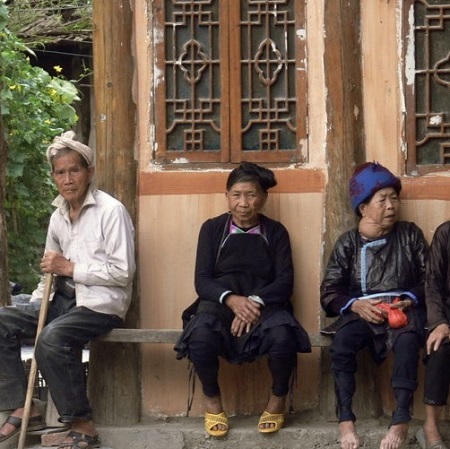 From Yangshuo take small paths along the Yulong River, through sleepy hamlets, rice paddies, peanut fields and fish ponds to the old preserved village of Jiuxian and its many traditional houses. Continue to the 400-year-old Dragon Bridge (also called Yulong Bridge). Lunch on the pier near the bridge. Back to Yangshuo by the other side. (Optional option to return part of the way in a real bamboo raft, without motor, powered by a gondolier on the bucolic Yulong river. Back to Yangshuo. Free morning, then transfer (without guide) to the airport or Guilin TGV station for transfer to your next destination. End of our services. Their length depends on the physical condition and the interests of the participants (discovery of minorities). Sometimes you have to seize opportunities on the spot (party). Some villages are 1/2 hour walk, others are 3 or 4 hours walk.